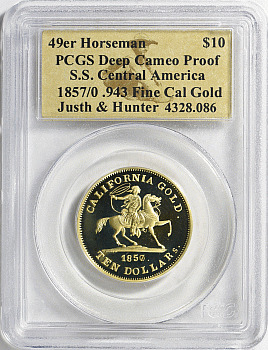 Struck from gold recovered on the famed shipwreck S.S. Central America, that is 0.943 Fine Cal Gold. With certificate hand-signed by Bob Evans, Chief Scientist, Historian and Curator of the S.S. Central America shipwreck. Coin weighs the same as the $10 Gold Eagle in net gold, AGW = 0.4836 oz. Description: Struck from gold recovered on the famed shipwreck S.S. Central America, that is 0.943 Fine Cal Gold. With certificate hand-signed by Bob Evans, Chief Scientist, Historian and Curator of the S.S. Central America shipwreck.